ANAHEIM, CA – February 23, 2009 – CIRCOR Aerospace, Inc. has entered into a sales representation agreement with Russell Associates for CIRCOR’s Aerodyne pneumatic controls product line based in Ronkonkoma, NY. 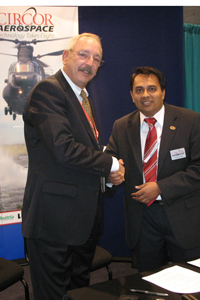 Signers Godwin Abele of Russell Associates and Anish Patel of CIRCOR Aerospace were on-hand at the Heli-Expo tradeshow earlier this week to finalize the deal. Russell Associates will increase customer connectivity and market presence for the CIRCOR/Aerodyne’s pneumatic valves, regulators, and weapon ejection systems. “The addition of Russell Associates and their national network will drive increased customer awareness of Aerodyne’s products and capabilities,” said Anish Patel, CIRCOR Aerospace Vice President of Business Development. “We look forward to this new team effort and the positive national reach Aerodyne will gain from it,” said Godwin Abele, Russell Associates’ Senior VP. Russell Associates, a technical sales organization, has represented component manufacturers for the sale of engineered products and systems to the Aerospace, Military and Mobile Markets since 1942. Aerodyne Controls, a CIRCOR Aerospace. company, designs and manufactures high-quality pneumatic control components and systems for the aerospace, defense, space, and alternative fuels markets.